It started as a chilly day and warmed up as the players took the field. The first day of full team practice added the position players to the mix as well as some additional minor leaguers. You can watch our video below to see players such as Mark Lieter, Jr, Aaron Altherr, Michael Mariot, Elniery Garcia, Freddy Galvis, Odubel Hererra, Brock Stassi, Tyler Viza, Caleb Eldridge, Roman Quinn, Miguel Nunez, Rhys Hoskins, Alberto Tirado and Jeff Singer. To watch the video, click HERE. Dylan Cozens hits a homer over the brand new Robin Roberts scoreboard. This is one of my favorite things to take part in as it’s so cool to be included with so many other reporters and bloggers whose work I enjoy reading. As you can see, I have been able to take pictures of all but two, and I have seen all 25 but sadly the two I missed were on days where I didn’t have my camera with me or the battery was dead by the end of the day during spring training. So Ross and I really put a lot of thought into our list. It’s enlightening to see where all they players fall per the weighted vote. Of the list, Ross and I could see almost any of them on the list though may be in a different position (as was evidenced by our differences on our list). I will find it interesting to see how this pans out in the future. It was a beautiful evening here in Clearwater for the annual “Meet the Threshers” picnic for season ticket holders. It’s a fun time where we had a chance to have a nice meal and hob-knob with the players. After everyone had a chance to eat, the voice of the Threshers, Kirsten Karbach introduced the team. You can see video of the introductions HERE. The season kicks off tomorrow night in Dunedin against the Blue Jays. 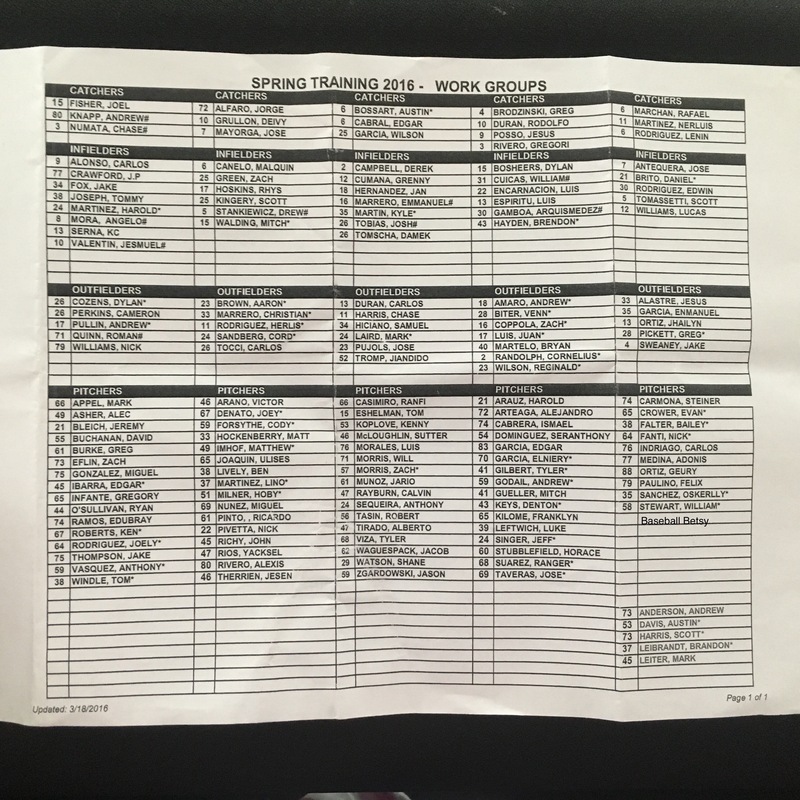 After the latest round of releases, the newest work group list was handed out at the Carpenter Complex. 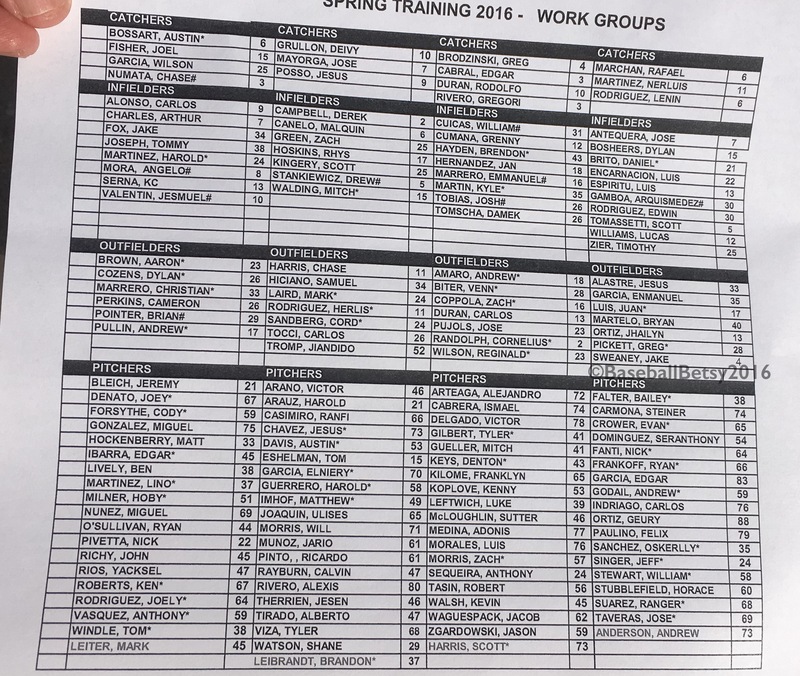 This list is as of March 18, 2016. If you have questions about the list, I’ve answered the most common ones HERE.